I’m seeing a very creative idea with the Adventure Awaits Hershey Postcard Look Wrapper. There are so many fun ways of using this not only for a birthday wrapper but also for any custom favor uses. 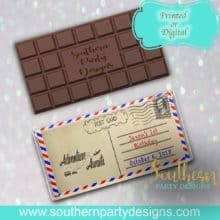 At SouthernPartyDesigns is available in a downloadable printable pdf or printed and shipped to you. We are talking about the wrapper only, it is up to us to fill with the actual chocolate bar(s)! Note the processing time for digital orders is 1-3 business days; for printed and shipped it is 1-2 weeks. “-Adventure Awaits chocolate candy bar labels/wrappers. The pricing is showing beginning at twelve dollars for the custom digital pdf. It looks like as a party favor you would want everyone to get the same message so the quantity ordering makes sense. I’m going to have to find out what to do where I want an individual different name on each one, i.e. 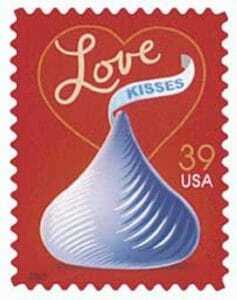 for sending separately to PenPals scattered around and about! If going with a quantity then I’m thinking the message would probably be a generic message… stay tuned! Thank you for joining me today. Tomorrow we kick off a new week and will find ourselves at the half-way mark for January 2019. Here’s to Hershey’s Almond Candy Bars!